In VOX's history, there may never have been a series of amps boasting such a lofty and pure sound as the new Hand-Wired Series amps, which includes the AC15HW1 15W combo. The VOX Hand-Wired Series relies on the painstaking technique of turret board hand-wiring, a method requiring a high level of skill and craftsmanship. The result is wiring that's beautiful in its artistry and ensures an efficient signal path with minimal loss and no restriction in amplitude. In the AC15HW1 combo, tubes, transformers, speakers, chassis, and custom parts all join together in an ideal state to deliver the richest and most powerful sonic experience - the ultimate VOX amp. Not bound by tradition, the VOX Hand-Wired Series also provides a variety of new functions that keep pace with the needs of today's artists. Offering a rich variety of tonal shadings, the enormous potential of the VOX Hand-Wired AC15HW1 combo will reveal itself in any musical scenario. Turret board hand-wired amps are every amp designer's ideal and every guitarist's dream, representing the ultimate in amplifier construction. Hand-wired amps are assembled entirely by hand, requiring staggering levels of technical expertise and care, and as such are often exclusive to today's limited productions or high-end models. 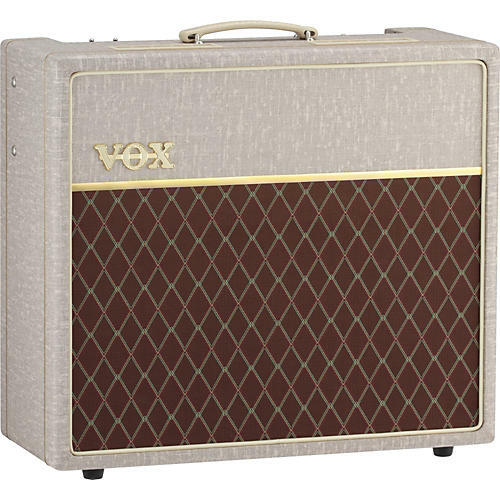 The VOX Hand-Wired AC15HW1 combo pairs these demanding methods with rigorously-selected custom parts. These premium components are wired with a truly artistic degree of perfection. The result is that the subtle nuances of the guitarist's touch, the guitar's audio signature, and the natural character of the vacuum tubes are passed with perfect transparency to its 12" Celestion G12M speaker, noted for their broad midrange attack and restrained top-end, providing a punchy attitude when chording, and a searing lead tone when driven hard. The VOX Hand-Wired AC15HW1 is a true all-tube amplifier, employing vacuum tubes in the preamp, power amp, and rectifier. The preamp uses three classic ECC83/12AX7 tubes, while the power stage uses a duet of EL84s, along with a EZ81 rectifier tube. Combined, these three elements provide the vibrant, organic, and unmistakable tone that is the heart of the classic VOX sound. The VOX Hand-Wired AC15HW1 amp preserves the traditional VOX two-channel design, providing a Top Boost channel and a Normal channel. True to form, the Top Boost channel delivers the legendary AC30 sound with a fully interactive tone stack. VOX has also added a new and unique Hot/Cool switch. The Cool setting produces the orthodox Top Boost sound, while the Hot setting bypasses the tone circuitry altogether to create a more pure sound to achieve richer gain. A VFS1 footswitch is included with this VOX Hand-Wired Series amp, so you can quickly change between Cool and Hot, right at those moments when you need an extra dose of drive. The controls for the Normal channel consist simply of a volume knob, giving you a cleaner and more natural tube sound. In addition, this channel offers a Bright switch that adds emphasis to the upper harmonics of the tone when engaged. The traditional, inimitable sound of the legendary AC30 continues to fascinate the guitarists of today. Many modern players have viewed this timeless design and desired more up-to-date options. While continuing to preserve the classic AC30's sonic character, the VOX Hand-Wired Series AC15HW1 combo offers the flexibility to meet the sound-creating requirements of a broad range of scenes and styles. The addition of a Master Volume and an Output Power (OP) mode switch lets you change the power amp's output level, delivering more detailed control over the gain/volume relationship, in turn providing more control over your sound. Despite being decked out in the retro-style fawn-colored vinyl suggestive of a 1960s-era AC30, this amp is not a mere nostalgia product. It's definitely designed for today's music scene. The old AC30 had no master volume, nor indeed do most hand-wired amps. With such amps, high-gain sound meant that you needed to play at high volumes. High volume is unavoidable if tone is the primary consideration, but it can be inconvenient in many situations. The VOX Hand-Wired Series provides a master volume control, but also provides an MV/Bypass switch that completely bypasses the master volume section. This means that the legendary sound that has fascinated guitarists for more than 50 years can be faithfully reproduced, giving you a direct and pure high-gain tone.